Madeira is full of marvels, from summits above the clouds to scenic levada trails, which pass through rural villages and forests. Go sledging in wicker toboggans then feast on the exotic fruits, fresh seafood and sweet liquors on offer. It's a paradise for foodies and adventurers alike. Cloaked in lush tropical vegetation thanks to a warm year-round climate, Madeira is part of a Portuguese volcanic archipelago in the Atlantic, over 300 miles off the North African coast. Only 21 km by 56 km, but exploring it takes a while due to its winding, dramatic roads with vertiginous views. On the island’s south coast is one of Europe’s tallest sea cliffs, the Cabo Girao, which is a dizzying 589 m high. Its near complete absence of beaches due to a coastline comprised of towering cliffs is compensated by a series of large, saltwater swimming pools hewn out of lava rocks. The rich volcanic soil has meant that first sugar and then vines and tropical fruit have grown in abundance. Madeira’s most famous export is its eponymous fortified wine. Surrounded by banana plantations on Madeira’s southeast coast, the island’s capital, Funchal, is on a horseshoe-shaped hillside overlooking the Atlantic. Named after fennel (funcho) which used to grow here, Funchal grew wealthy from its sugar industry that flourished in the 15th century. First inhabited in 1420, Madeira has remained largely in Portuguese hands. Funchal is a popular stopping-off point for transatlantic cruise ships, which regularly dock at the capital’s deep harbour, the scene of one of the world’s biggest New Year’s Day firework displays. Don’t miss seeing the casino, designed by renowned Oscar Niemeyer in the late 70s, and the Se, the capital’s magnificent whitewashed 15th-century cathedral. See some of the islands colourful produce piled high in one of Funchal’s markets, such as Mercado dos Lavradores. Around 4 km from Funchal are the botanical gardens, with superb views over Funchal harbour, displaying 2,000 species of tropical and subtropical plants which grow on the island, such as bird of paradise, jacaranda, bougainvillea, frangipani and orchids. Madeira’s levadas, some dating back to the 15th century, are irrigation channels snaking along steep mountainsides, bringing water from the wet mountains to the drier cultivated land. Covering over 2,000km, the levadas have maintenance paths built alongside them, forming a network of natural walking trails all over the island. The craggy Sao Lourenco Peninsula, a protected area in east Madeira, has some good walking trails past volcanic rock formations and with sweeping views over the Atlantic. 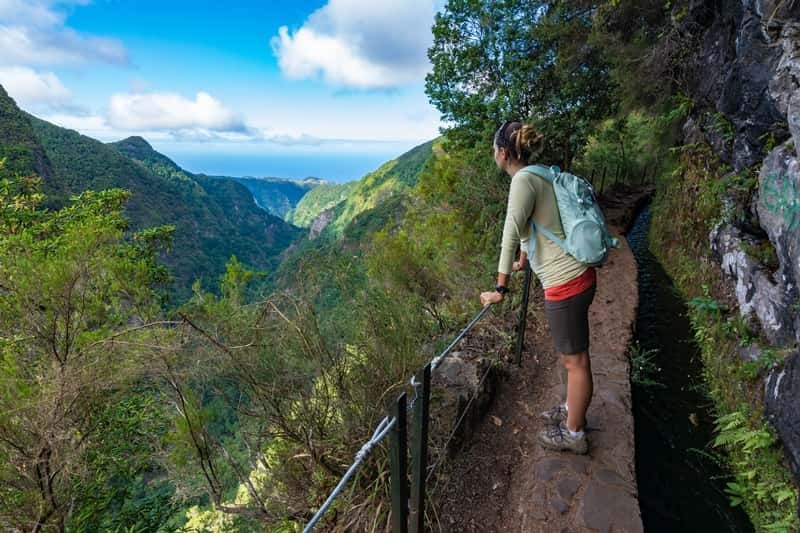 For the best views of the island, you’ll have to scale the peaks of Arieiro (1,818 m) and Ruivo (1,862), the latter Madeira’s highest peak, set in the volcanic landscape characterising the rugged interior.